Basilicata is a region in southern Italy that makes up part of the boot shape that Italy is known for. It's one of the country's poorest regions economically, but it has a rich history and a beautiful, rugged landscape. Basilicata is mostly covered by mountains, but it touches two different bodies of water on Italy's coast—the Tyrrhenian Sea in the southwest and the Ionian Sea in the southeast. The part of Basilicata on the Tyrrhenian Sea is so small that there's only one town, named Maratea. Inland, the peaks of the Apennine Mountains are broken up primarily by rolling hills. The region of Basilicata was once part of Magna Grecia, and you can still see Greek temple ruins and other evidence of Greek settlements there. There are also Roman ruins and medieval castles. 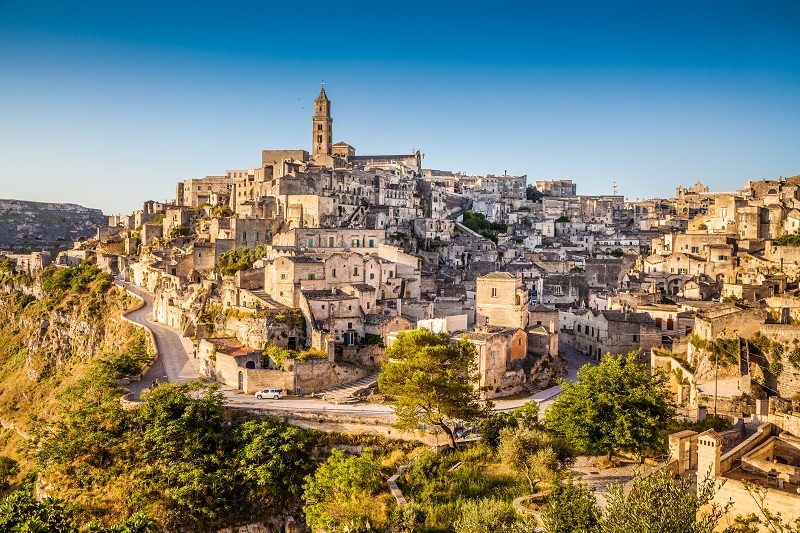 The biggest attraction in the region are the cave-like dwellings known as “sassi” in the town of Matera. They are Basilicata's only UNESCO site, and archaeologists believe people lived in them as far back as 7,000 B.C.E. With so much of the region taken up by mountains, it can be hard to get around much of Basilicata by train. Reaching the main cities and towns isn't necessarily a problem, but exploring beyond that requires a car.